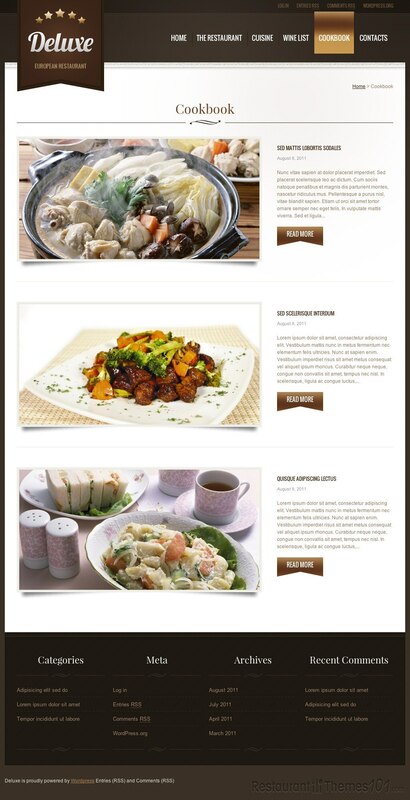 Deluxe is a WordPress restaurant theme featured on Template Monster, created by Mercury. 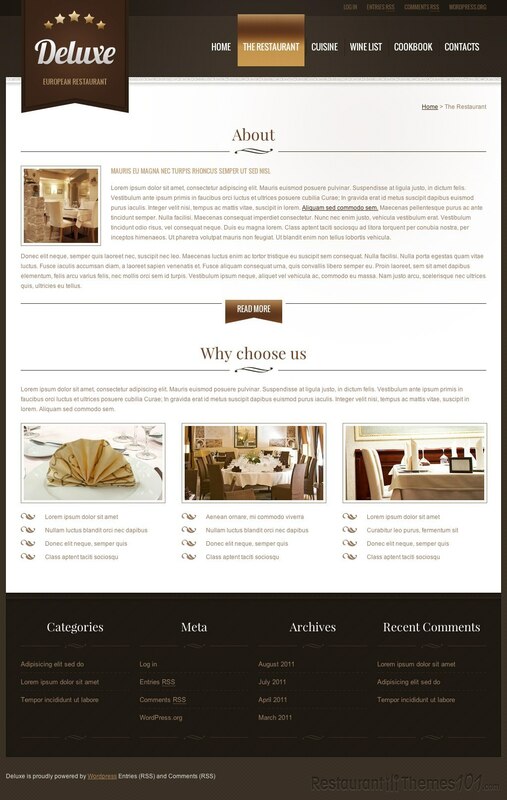 The theme has an elegant, luxury layout and it comes with several useful theme options. 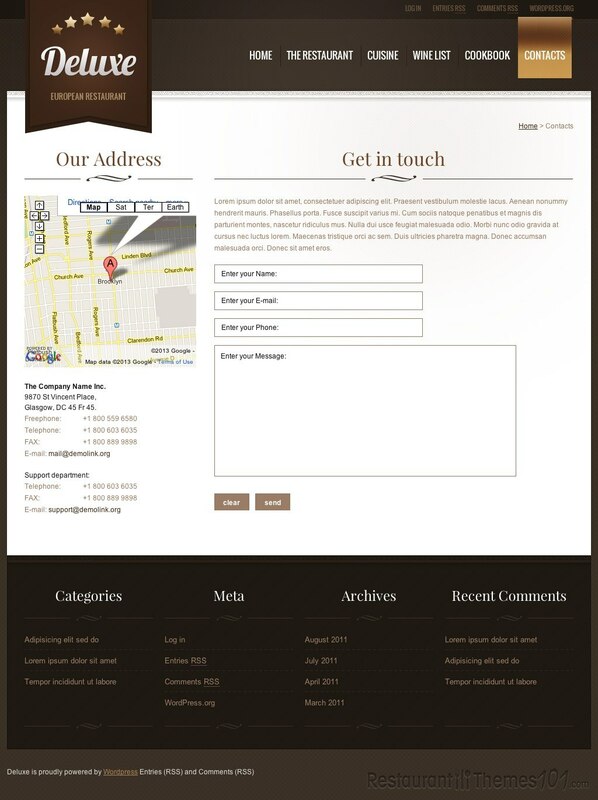 The layout of the theme has a great looking background with a nice pattern and a set of colors that will give your website a unique look and feel. Dark brown, white and goldish brown seem to be the winning combination for stylish, elegant websites, and this theme uses this exact combination of colors. The homepage features an elegant slider where you can place photos of anything you want and they will be displayed in a large format which will grab the attention of your visitors the instance they open your website. In the cuisine section you can feature your chef and your dishes, along with full recipes of them, if you want to, including photos. There is also a separate cookbook section where you can place all of your delicious recipes. You can announce your upcoming events to your visitors along with detailed descriptions of the events, or allow them to send testimonials about their experience with your restaurant, which you can wrap up and show in the testimonials section. 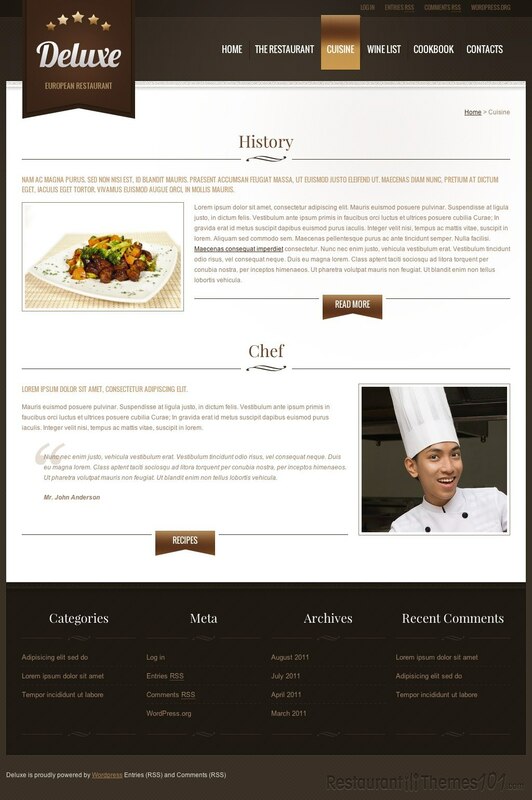 “The restaurant” section will show a drop down menu which includes services, events and a gallery. In the gallery you can make several different albums and place photos of your restaurant, your delicacies or anything else you want to show to your visitors. 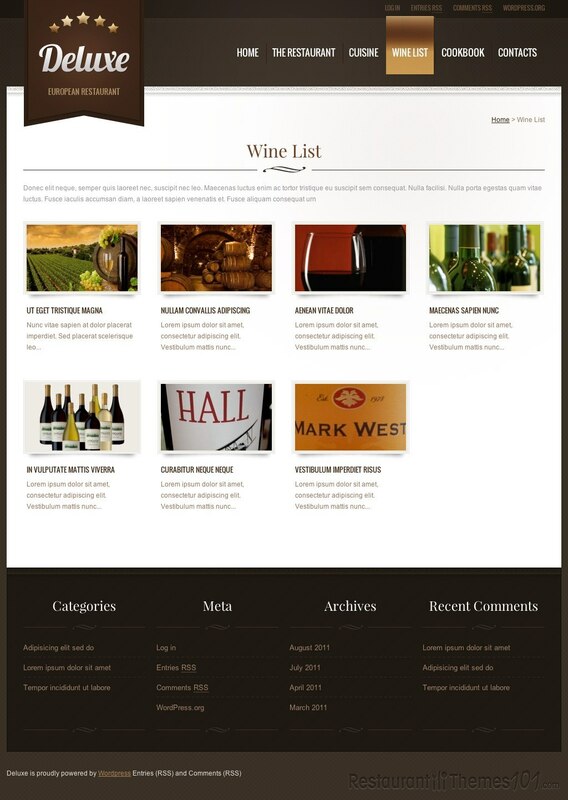 There is a separate wine list section also, and it will be very easy for you to create and showcase your wine collection. The Deluxe theme looks sensational, and you will be able to purchase it in several ways, beside the regular theme purchase. You can choose nice packages that include installation and domain along with the theme, or if you want to customize the theme a bit and make it even more functional, you can select a customization service for a small extra fee.